Marble countertops are amongst the most chosen countertops for the kitchen. They are not only durable, but they are also long lasting and give you a variety of design options to choose from. No matter how many colour choices other stones give you in the market, the white marble top has its own unique charm that gives you kitchen an amazing look every time you look at it. 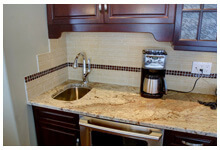 You can choose a variety of marble countertops Edmonton and get the one that suits your needs the best. Once the marble top is installed, you can expect years of trouble free life. Marble brings an instant rich look to the décor of your kitchen. Many people associate marble as a stone that has dark grains in design and often end up using it on the floors of the kitchen. The marble Edmonton is available in exotic shade of white, pink and grey and you can choose the one that goes best with the overall setup of your kitchen. You can even opt for the marble in yellow and orange shades. However, the best shade to go in for the marble is the ageless white. Marble countertops have smooth finish and they give you a silky texture every time you look and feel them. They are lot more durable than the vinyl countertops and they last really long then the wooden ones. Other tops are prone to pick up scratches from the knives and other utensils at the kitchen, while marble is less exposed to these scratches when compared. Marble countertops can be sealed to prevent all of these scratches. While working in the kitchen, you might not need the cutting board to chop of vegetables as you can directly do that at the top of the marble. As marble is naturally non porous, it is resistance to bacteria and it makes it ideal for handling food and other eatables. It can also be cleaned easily using regular soap and water. Marble always gives you a fresh clean look every time you wipe it. You can use the marble for various purpose and you don’t have to worry about putting a dent or leaving a stain on the surface of it. All you have to do it is wipe any spills that are on the marble using a damp cloth and you will be done with it. Once the marble is sealed, you can have an impression of luxury and elegance all year round. If you already have a countertop at your kitchen and you want to get it replaced by the custom marble top, then you can contact any professional marble service in Edmonton for the installation. They not only give you the right guidance, but they also help you several of options to choose from the marble stones. If you want your kitchen to be turned into a versatile and beautiful place, then the best option to get it converted is by putting a marble countertop.